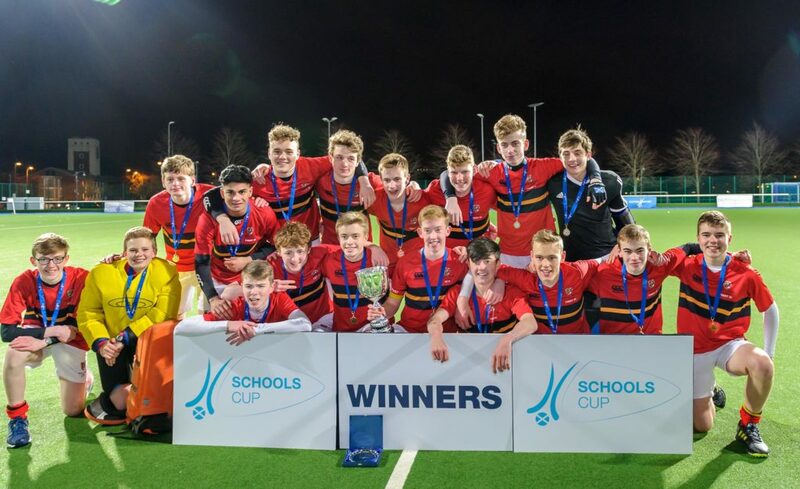 The Schools Cup Finals 2018 delivered a tremendous day of youth hockey with twelve matches across two pitches. 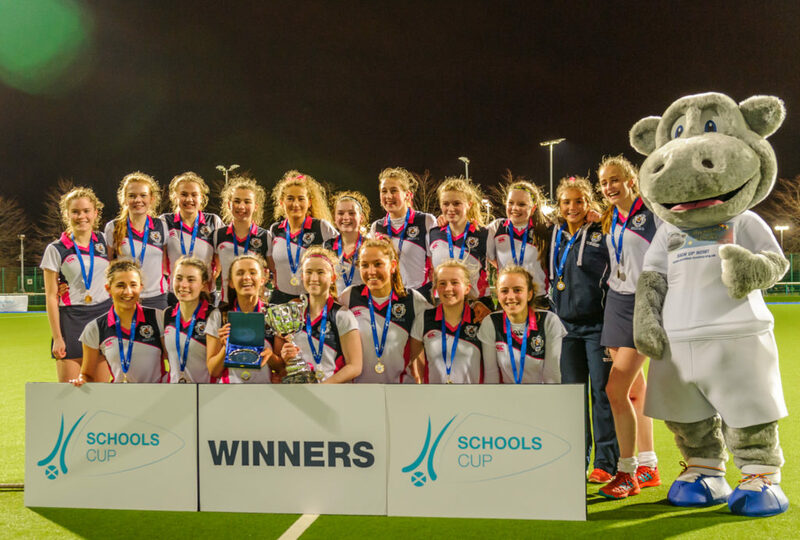 One of the finest nights on the Scottish Hockey calendar, the Schools Cup Finals 2018 treated a huge crowd at the Glasgow National Hockey Centre to a feast of drama, goals, and fantastic hockey. 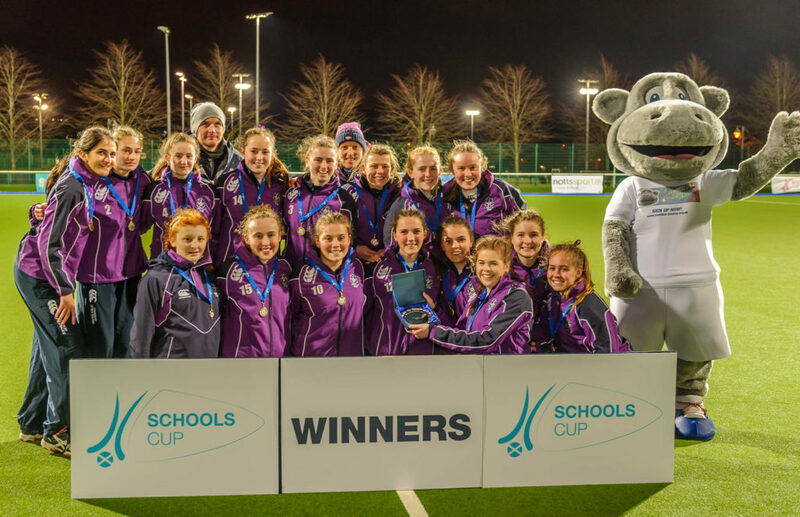 Dollar Academy was in the money as the school recorded an emphatic 3-0 win over Craigholme to win the Open Girls Cup Final. The second last match of the Schools Cup Finals 2018 drew the biggest crowd and an exceptional support. The winners were in control for much of the match, and took the lead after just under 15 minutes, Rhiannon Carr opening the scoring to make it 1-0. Georgia Smith then doubled Dollar Academy’s lead, giving them a comfortable lead heading into half-time. Craigholme made a valiant effort to get back into the game and did create one or two chances after the interval, but Dollar Academy remained mostly comfortable and never looked like losing their lead. They were able to then scored a third goal at the very end of the game, ensuring their win and capping off an excellent performance. 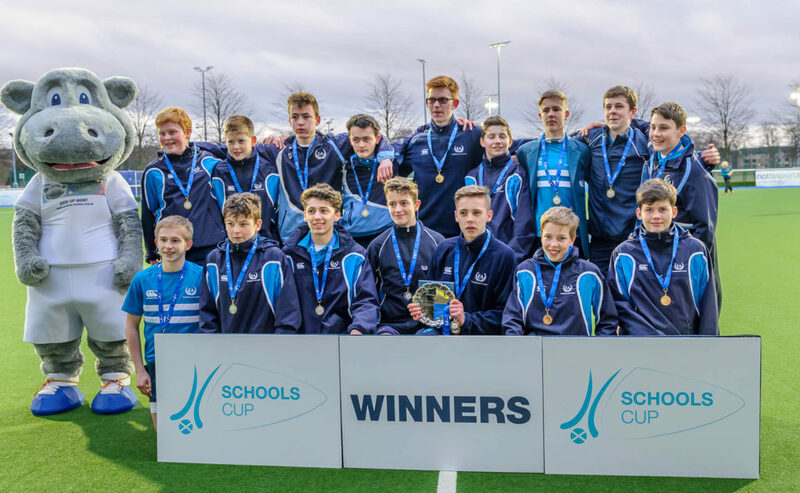 Stewart’s Melville College defeated Hutchesons’ Grammar School 4-2 in an exciting Open Boys Cup Final. 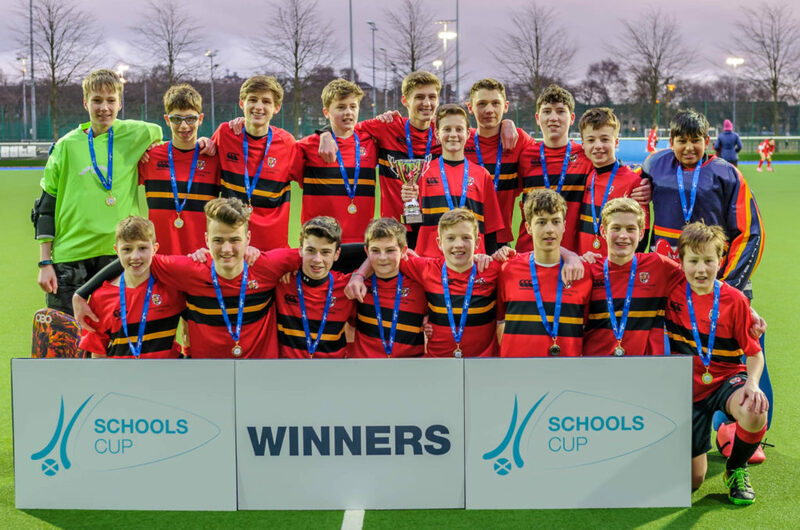 It was the final match of the Schools Cup Finals 2018 and certainly didn’t fail to deliver a tremendous climax to the event. After an even start to the game, Robbie Croll opened the scoring for Stewarts Melville in just under ten minutes courtesy of Robbie Croll. Before half-time the eventual victors doubled their lead, Sam Tait taking advantage of the ball falling to him on the line and sending it home. While both sides had been fairly well-matched, Stewart’s Melville had been more incisive going forward and had defended well. Hutchesons’ Grammar soon struck back though, Struan Walker reducing the deficit with a sensational goal that saw him dribble past several players before converting. They tried to push for a second and came close to equalising, but Stewart’s Melville remained resilient and killed off the game with five minutes to go, Croll scoring his second goal of the game. Alex Riddell then added a fourth, and while David Nairn scored a consolation goal for his side to make it 4-2, but Stewart’s Melville emerged as the clear victors in what was a terrific final. 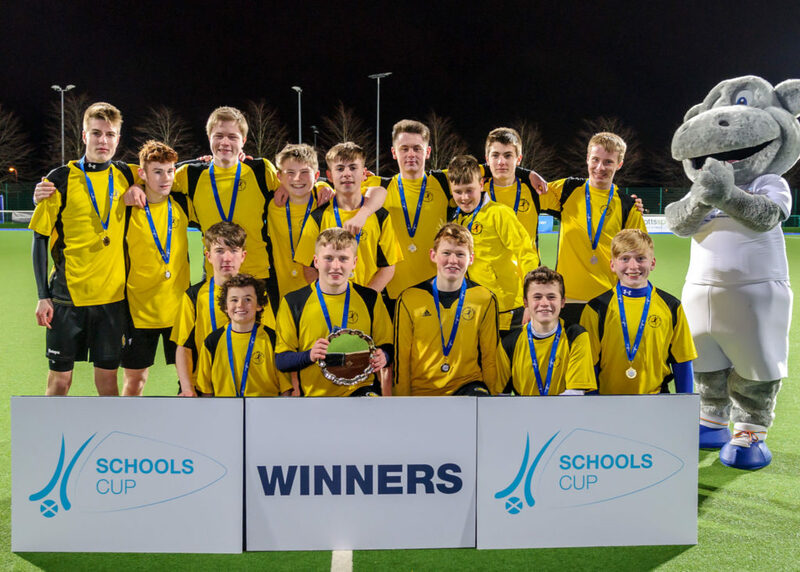 The Pitch 1 opening match of the Schools Cup Finals 2018 saw Harris Academy take on Beaconhurst, and it was Harris Academy who were the victors in the Aspire Boys’ Plate final with a 1-0 win. There was plenty of good early pressure coming from Harris from the outset, they looked composed in possession, while Beaconhurst did a good job of keeping the backdoor shut. Fraser Allan for Harris had the game’s first attempt when he swung at the top of the D but didn’t connect properly to get a shot away. Harris Academy then had a penalty corner zip just over the bar. Cameron Bell looked dangerous for Harris, he was very skilful in possession and was causing problems with his pace and control. Harris took the lead just after half time when Allan finished off a slick penalty corner routine, scoring from close range. 1-0. Both Allan and Bell had chances late in the game but some fine goalkeeping by Daniel Banks kept Harris at bay and the match finished 1-0. 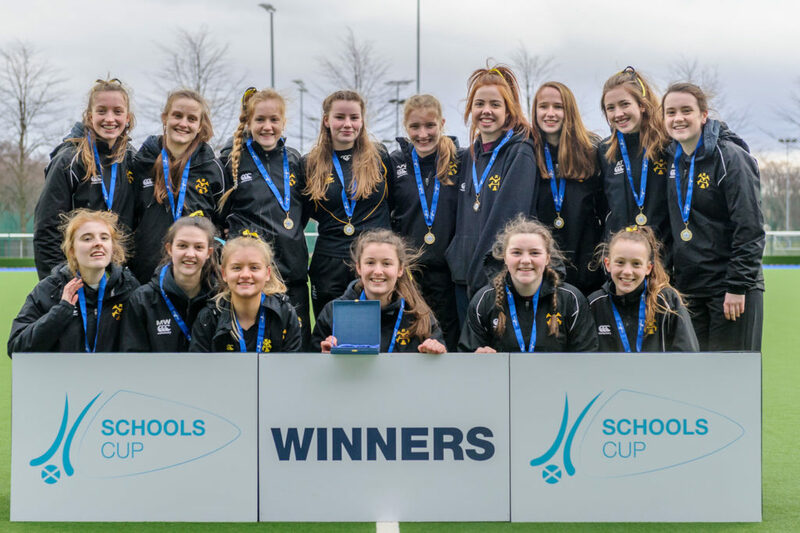 The first contest of the Schools Cup Finals 2018 saw a 2-0 victory for Perth High over Millburn in the Aspire Girls’ Plate final in an entertaining contest on Pitch 2. Perth piled on lots of pressure from the outset but Millburn did will to keep them at bay throughout the first half. The break through finally came for Perth at their sixth penalty corner of the match. Perth took the lead in the thirtieth minute of the match when Ruth Blaikie fired home from a penalty corner. Just three minutes later and Rachel Bell scored to make it 2-0 for Perth when she scored from open play. There were no further goals and it was Perth High who ran out comfortable winners to lift the Plate. Trinity Academy won the Aspire Girls’ Cup after a dramatic shootout in Glasgow. It was one of the tightest games of the Schools Cup Finals 2018, and throughout the contest there was some great play from both teams with the goalkeepers making some excellent saves. The game finished 0-0 and went to running penalties to decide the winner. 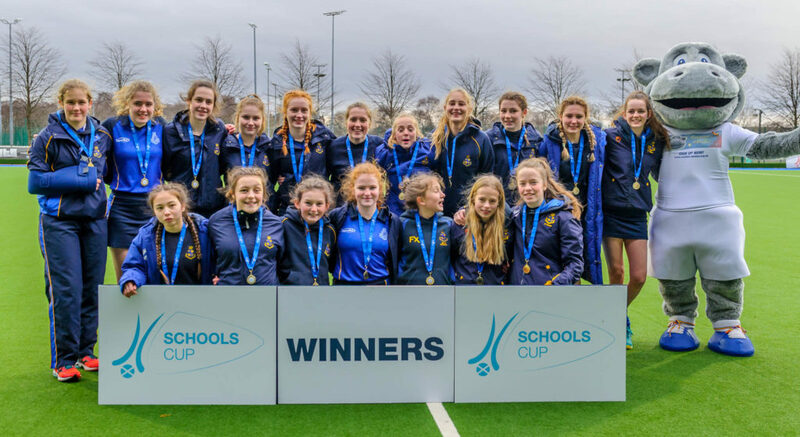 Aberdeen Grammar scored through Katie Charles, Deirdre O’Riorden, and Ariana Correa, while Jennifer Veitch, Joanne Boyle, Amy Hall scored for Trinity. In the 4th running penalty, Charlotte Drainer got stick tackled resulting in Joanne Boyle scoring with a penalty flick. The winner was finally secured in the 5th running penalty with a penalty flick from Jennifer Veitch just after Jocelyn Low was taken out by the goalkeeper, giving Trinity the victory. Douglas Academy was victorious in the Aspire Cup final, recording a convincing 4-1 win against Renfrew Schools to seal the trophy. 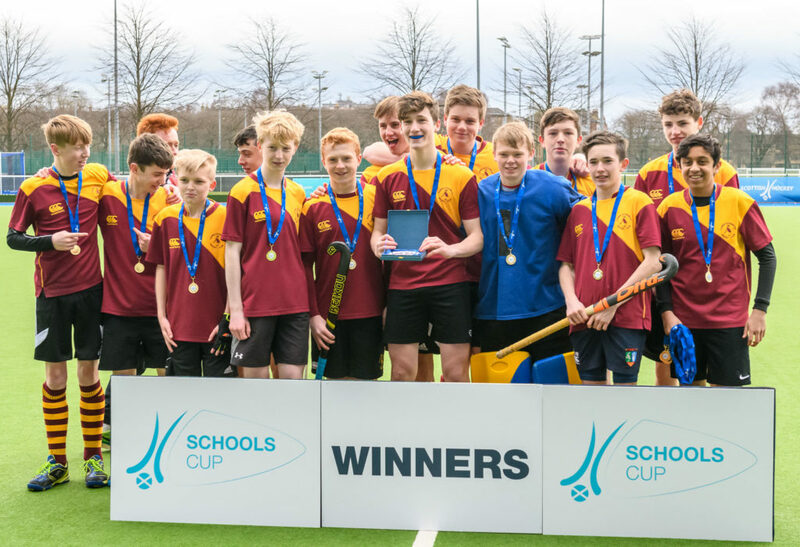 Winning captain, Andy McConnell, was the star performer for his side, scoring all four goals – a terrific individual performance in the Schools Cup Finals 2018. The game was initially fairly even contest, however Douglas Academy took firm control of the game after they opened the scoring. McConnell then added to his tally just before half-time, and sealed his hat-trick after the restart. Renfrew managed to mount a brief comeback midway through the second half after they scored their solitary goal to bring it down to 3-1, but McConnell then scored a fourth to ensure victory for a dominant Douglas Academy. High School of Glasgow won the S3 Girls Cup in dramatic fashion, a 3-1 running penalties victory following a 1-1 draw against George Watsons. The game was an even affair early on, and it wasn’t until 20 minutes had been played for the scoring to be opened, George Watsons opening the deadlock courtesy of Kirsty McCallum. There had been little to separate the sides, and the Glasgow side struck back early in the second half, Anna Smith making it 1-1. The contest began to heat up, both sides confident they could win as fans watched entertaining end-to-end hockey. With neither side able to score, it soon went to running penalties where the Glaswegians ran riot. Christina Miller set the tone, scoring first for the eventual winners. 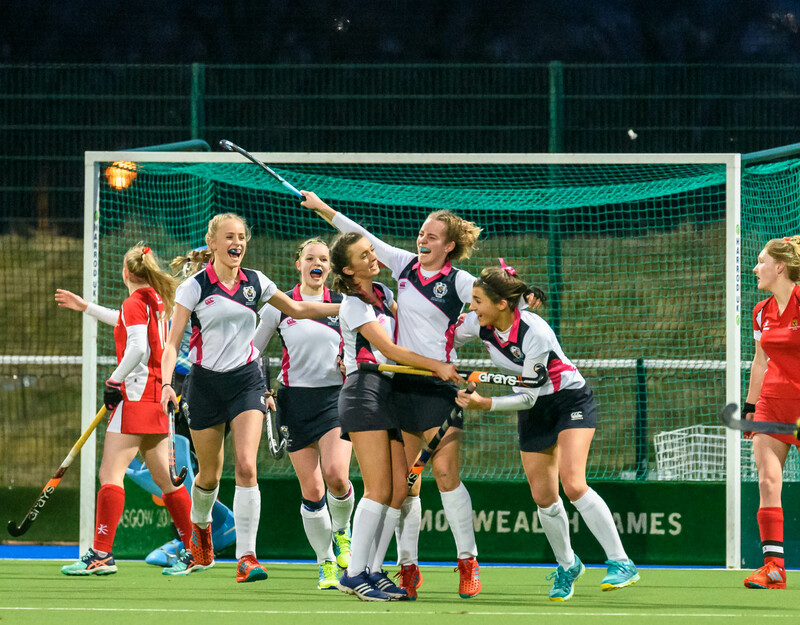 While Emily McGlynn struck back for George Watsons, the Edinburgh side were unable to find the net again, High School of Glasgow’s goalkeeper producing an excellent performance to win the cup for them. 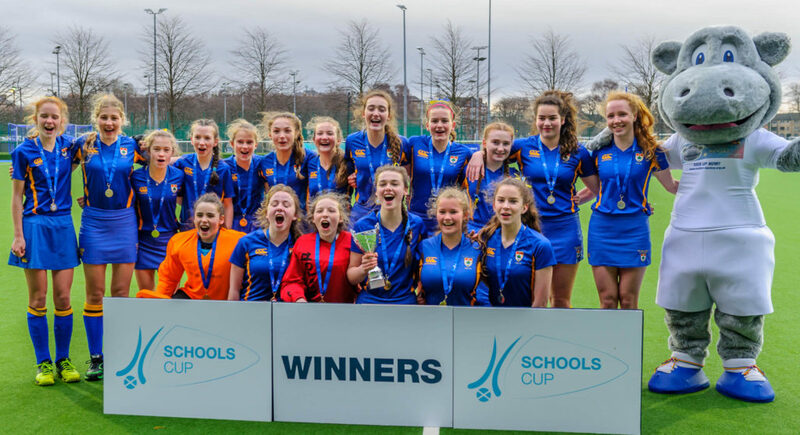 Strathallan won the S3 Girls’ Plate with a 1-0 victory over High School of Dundee at the Schools Cup Finals 2018. Strathallan scored early in the match in open play to go 1-0 up in the first five minutes. The ball was struck low into the back of the net to give Strathallan the lead. The contest raced from end-to-end with both sides looking threatening. It was a close game and High School of Dundee created chances to equalise but couldn’t find the net. In the end it was Strathallan who took the silverware with a 1-0 win. A sensational S3 Boys’ Plate final ended with Edinburgh Academy winning the Plate after running penalties. Jordanhill took the lead in just the third minute of the match when Euan Menzies struck from a penalty corner to make it 1-0. Menzies was at it again a few minutes later when he scored from open play to make it 2-0 and put Jordanhill in the driving seat. Edinburgh quickly pulled one back through Charlie Temperley in an exciting opening to the match. The team from Edinburgh then equalised through Nico Temperley before David Macrae struck to give Academy a 3-2 lead. Jordanhill equalised from a penalty corner through Finn Herbert to bring the game to 3-3, which was how it stayed until full time. Running penalties saw Edinburgh take victory through strikes by Macrae, Magnus Harkness, Charlie Temperley, and Freddie Northam. Kevin Lynch-Small and Menzies scored for Jordanhill. 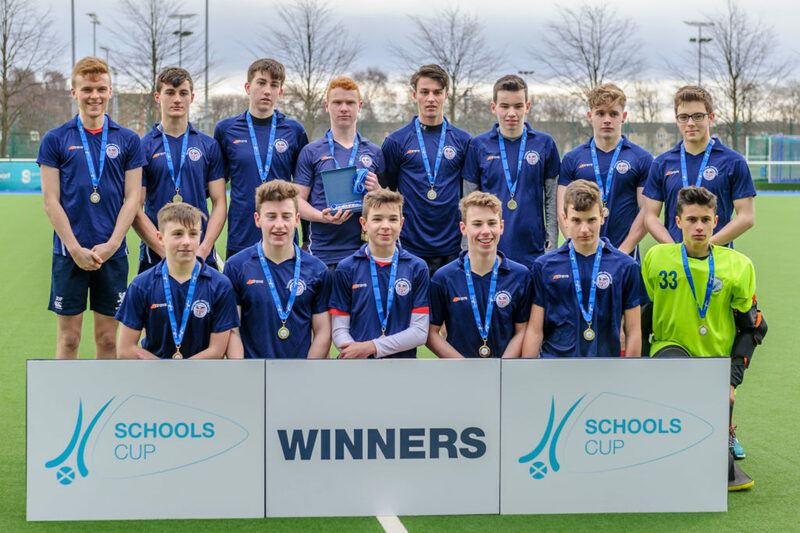 Stewart’s Melville College won the S3 Boys’ Cup after an exciting contest against George Watson’s College in the Schools Cup Finals 2018. It was a lightning start by Stewart’s Melville, which saw them take an early lead in the S3 Boys’ Cup with a sublime penalty corner finish by Callum Maclennan. 1-0. It then went to 2-0 with a quick-fire second goal by Jamie Croll. As the half progressed Edward Summers showed some lovely skill for Stewart’s Melville, weaving through the defence, however there was no finish to match the build-up. As half time approached Jamie Eyton-Jones very nearly equalised for George Watsons but the ball zipped past the upright. Just after half time George Watson’s hit the net through a penalty corner strike by William Stark. Croll hit the net for Stewart’s Melville almost immediately with a neat finish from close range to make it 3-1. The game got feisty with both sides battling hard for the win. George Watson’s pulled another one back when Andrew Hill scored a flick to bring the score back to 3-2 in the S3 Boys’ Cup with three minutes to play. It ended 3-2 with Stewart’s Melville taking the trophy. The Glasgow Academy won the Open Girls Plate with a fine 4-0 win over Hawick High School. It went 1-0 to The Glasgow Academy from a Katie Prentice penalty corner strike in the Open Girls Plate just before half time. It went to 2-0 for Glasgow with another penalty corner strike, this time Nina Boothby got her name on the score sheet. The Glasgow Academy fired home an open play Kirsten Cannon shot to take their advantage to 3-0. As the game neared a conclusion it went 4-0 with four minutes left, Eve Denholm completed the scoring. 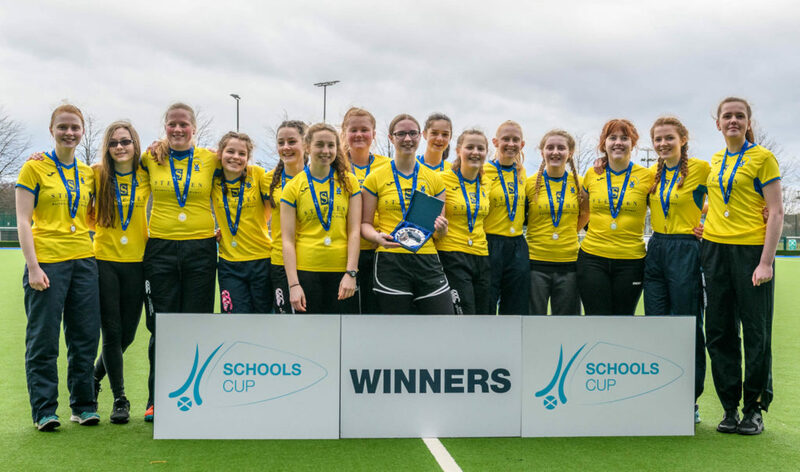 The Open Girls Plate went to Glasgow when it finished 4-0 to Academy, a fine victory versus a gallant Hawick High in the Schools Cup Finals 2018. Glasgow School of Sport won the Open Boys Plate with an excellent 5-1 victory over Loretto. There was an equaliser soon enough through an open play shot from Lucas Brook taking the game to 1-1. School of Sport retook the lead before half time when Moran struck his second to make it 2-1. The second half saw both teams battling hard but it was the boys in yellow who converted an intricate build up play with Fraser Moran bagging his hat trick to make it 3-1. Euan Cochrane then scored from open play with a reverse stick shot to make it 4-1. Moran was on the score sheet again scoring his fourth and School of Sports fifth to make it 5-1. Written contributions by Justin Bowie.